For most basketball fans, there are two types of people in the world: Those who like Kevin Garnett and those who do not. 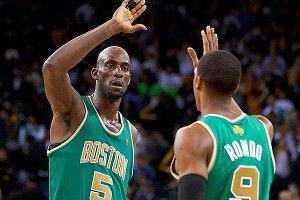 For Kevin Garnett, there are two types of people in the world, as well: People he likes and nobodies. You hear those trumpets blaring and those banners unfurling? (You can totally hear the banners unfurling.) That’s Jeff Teague being inducted into the latter group. On Monday night, the Celtics beat the Hawks in an offensive fireworks display that will no doubt be memorialized in song. A song like this one. There are few things in life more amusing than when KG declares somebody a nobody. Teague joins the illustrious company of Charlie Villanueva (“It’s a nobody. I’m not paying attention to nobodies”) and Joakim Noah (“I’m not entertaining nor addressing nobodies”). Nor! Yeah, so, if I were Jeff Teague — not that he needs my affirmation of his existence — I wouldn’t take it too hard. He’s in good company. As for Kevin Garnett (a.k.a. Taking it too far since 1995), keep insisting people do not exist because they have the temerity to dunk on your teammates. After all, there are two kinds of people in the world. At least half of them find it all hilarious.